Data loss can happen due to various reasons. Important files, folders and vital content can become corrupted or lost either due to device failure, malware activity, power outages or simply for any other reason. To recover deleted files without any expensive technical know-how can be difficult limited without using proper tools for it. 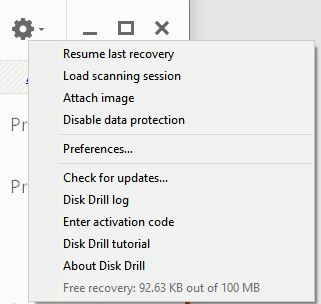 Disk Drill for Windows is a file recovery software that can get back all the deleted data quickly and without a steep learning curve. It supports file recovery from most of the widely used file systems including FAT, HFS+, exFAT and NTFS. Various types of files including video, audio, text documents, PDF and more can be recovered when using it. Offers Quick Scan and Deep Scan options. Both can be used depending on recovery requirements. Protects partitions and data from accidental deletion using Recovery Vault feature. The free version will recover lost data but the recovery is capped till 100 MB. The main user interface is like a standard disk manager. It lists various storage devices and partitions both for external and internal hard drives. How to recover deleted files: To begin recovery, choose the required partition from where the data has gone missing and click Recover. Data that can be recovered will be displayed. It can also be filtered to include a certain type like only video/audio or all of it. Select the specific folders/files to get back and click RECOVER. The process will continue and display the total recovered data. As the free version of Disk Drill is capped till 100 MB of recovery, the limits will be updated to reflect that. To save time, previous recovery and scanning sessions can also be loaded. This is through the Settings option. Besides that, partitions saved as a disk recovery image can also be attached. Deep Scan and Quick Scan: Deep Scan is a comprehensive but slower data recovery scan and is best suitable for recovering data that has been deleted a while back. As it will try to find these old files and put them together for restoring, it will be a slower process. Quick Scan is best for recovering small and recent files. Less time is needed for getting back such data. Recovery Vault Protection: Disk Drill can protect partitions through the Recovery Vault feature. It basically runs silently and keeps a track of deleted data (like System Restore in Windows). To enable it, click on PROTECT next to the required partition. Individual files and folders can also be added for protecting them. File recovery will be a lot quicker as Recovery Vault will immediately identify such deleted files and get them back quickly without deep scanning. So, this is great for important data that is subjected to a lot of changes and can result in accidental edits or deletion. Overall, this is an easy to use file recovery software for Windows and all it takes is a few clicks to get back all the lost data. No doubt that this software is good. But, being a tech person I must say that I have recently gone through the latest version of Stellar Phoenix Windows Professional software, and it works as same as what it says. This is quite an impressive software I have ever seen in my life. Easy to use interface, great functioning, etc. Thanks for sharing about Disk Drill too. I think you should try Stellar software too.